We specialise in all aspects of loft conversions, specialising in converting trussed roofs to accommodate dormers and velux windows. Estate agents say a fourth bedroom is the single most valuable feature a family house can have and usually converting an attic is simpler than building an extension. If you are considering an extra bedroom or to use as an office, from the design to completion of the loft or attic space, then please contact us for information. If you just require a velux window or pull-down stairs, we will cater to your needs. We also convert flat roofs to traditional or trussed roofing construction, finishing with tiles or slates to match the existing. 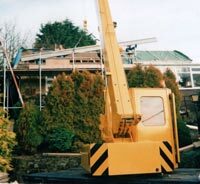 You are not normally required to apply for planning permission to re-roof your house, insert roof lights or skylights. You will be required to apply for planning permission if you live in a Conservation Area, a National Park, an Area of Outstanding Natural Beauty or the Broads and you would like to build an extension to the roof of your house or any type of addition which would materially alter the shape of the roof.